Our practice has an interesting history dating all the way back to 1939. 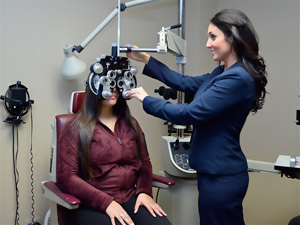 At Halsted and 79th Street, Dr. Weinberg and Dr. Custard developed one of the largest optometric practices in the area. They adopted a professional yet highly personal atmosphere, which has remained over the years. In the early 1960’s the office was moved to a larger location at Maplewood & 95th Street in Evergreen Park. In 1973 Dr. Robert Van Lente joined the staff and Dr. Michael Leahy came aboard in 1981. They formed a partnership and fostered a modernization of the practice that paralleled the evolution of optometry as a profession. In 1986 we further expanded by adding an Orland Park office that had been developed by Drs. John and Dan O’Brien. In 1993 we moved the Evergreen Park office to its current location at 4445 West 95th Street in Oak Lawn. Presently, with these two locations, we are able to provide services for a large section of the south side and southwest suburbs. We were fortunate to be joined by Dr. Christine DiSalvo-Ost in 1988 and Dr. Christine Walko Leahy in 1995 and they continue to infuse new methods and ideas that keep us on the cutting edge of optometry. As our practice grew, so did the staff. We now boast a highly experienced and professional crew of 30. A few of our optometric assistants have been with us from the beginning, and 16 have been aboard for over ten years. Our offices continue to grow, providing state of the art care with a special interest in the diagnoses and treatment of eye disease. We also pride ourselves in our modern equipment, and we offer the latest in frame styles and hi-tech lenses and contact lenses.